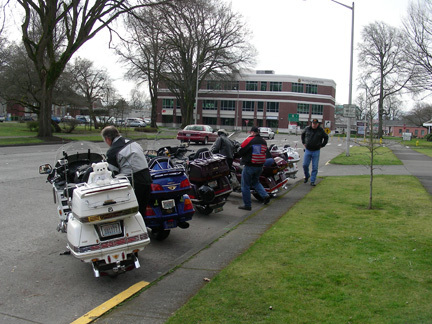 The weekend started by going with GWRRA Chapter X (our current chapter, in Vancouver) to the Saturday breakfast meeting of Chapter P (our previous chapter, in Longview), a ride of about 30 miles, one way. After breakfast we mounted our bikes and headed back south through Vancouver and then east along the Columbia River on Highway 14, a two lane road. Our destination is the Maryhill Winery for lunch. It is about 100 miles from Vancouver. 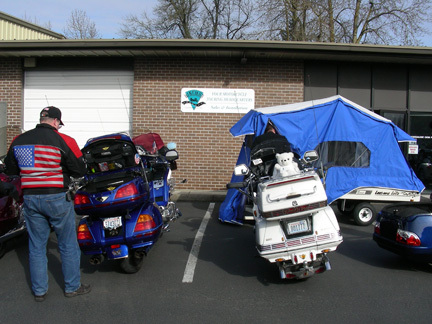 But first we had to make a stop at Wingman, the best independent GoldWing shop in the Northwest. It is located in Portland, Oregon. Here several of the members spent money and/or used the bathroom. In March of 2011 Wingman closed the retail outlet. The service department is still open under the name of Cycle Specialties. 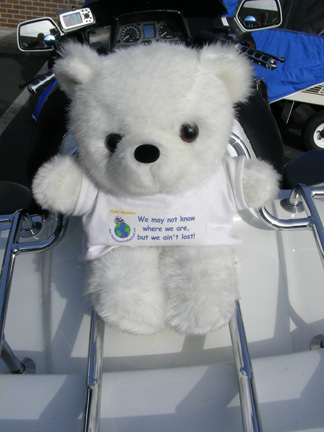 The white bear in the picture is on our bike and has a t-shirt that reads "We may not know where we are, but we ain't lost!". 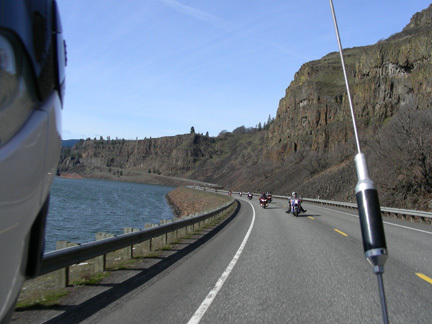 We then rode the windy (as in a curvy road), windy (as in blowing air) and scenic road through the Columbia River Gorge. 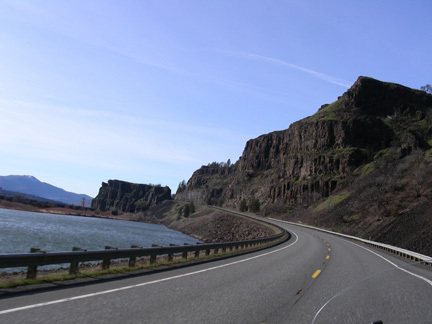 The gorge is the only way for rivers west of the Rocky Mountains and east of the Cascade Range to get through to the Pacific Ocean. All of Idaho, western Montana, eastern Washington and eastern Oregon drains through here. It is important for fish migration as well as shipping. 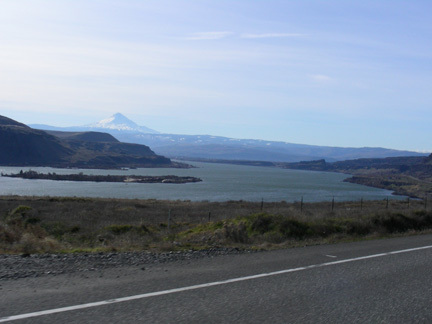 The Washington side of the river has Hwy 14 and a railroad track, the Oregon side has Interstate 84 and two railroad tracks and the water has many barges. Truck, trains and barges all are moving freight through here. And the wind is always blowing, creating one of the best windsurfer spots in the world. When we arrived at the winery we found out that the restaurant was closed so after looking around in the gift shop we mounted up and left. At this point the group broke up and went to different locations to eat. We headed back west to the town of Bingen and a Mexican restaurant we had been to before. On the way back west we had an excellent view of the river and Mt. Hood in Oregon. Mt. Hood is one of the volcanoes in the area. Within a half-day's ride of our home there are at least seven volcanoes: Mt. Rainier, Mt. St. Helens (which erupted in 1980), Mt. Adams, Mt. Hood, Mt. Jefferson, The Sisters (three or four peaks on one mountain) and Mt. Bachelor. They range from about 8,000 ft. (2,600 m.) high to about 14,000 ft. (4,500 m.) high. Mt. Hood in the picture is a little over 14,000 ft.
After eating we rode back home along Hwy 14. Now the nice tail wind has become a head wind and we get battered by it as we ride along the cliffs and through the tunnels. We rode about 275 miles (440 km.) this day. On Sunday we went by ourselves to Astoria for lunch. The town of Astoria was one of the first settlements in the area. It is on the south (Oregon) side of the mouth of the Columbia River. We rode to Longview (where we had breakfast yesterday) and crossed over the river to Highway 30. 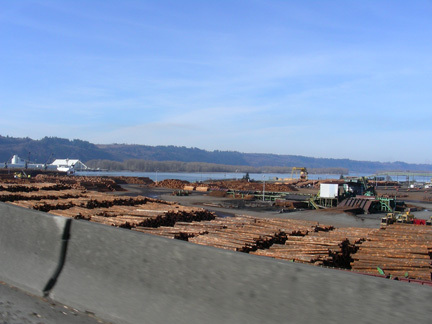 Longview is a major shipping port for logs and lumber used by the Pacific Rim countries. There is a huge log shipping yard on each side of the bridge. In Astoria we ate at the Fort George Brewpub. Fort George was the name of the original fur trader outpost here. 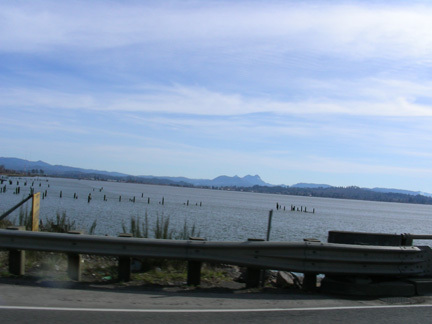 Highway 26 runs over the Coast Range, a low mountain range about 2,500 (800 m.) high. The tall trees created a lot of shade and at the pass through the mountains there was a lot of snow piles along the road. This made for the coldest part of the weekend, the temperature was in the high 30's F (3-4 C). The rest of the weekend we had been in temperatures of 50-60 F (10-15 C). This day we traveled about 150 miles (270 km.). All in all it was a great weekend. It felt good to be riding again.